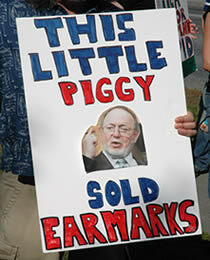 Don Young nominated for "Porker of the year"
Alaska Republican Congressman Don Young has been nominated for the 2007 Porker of the Year award by a budget watchdog group - Citizens Against Government Waste. Young, also under multiple criminal investigations , for bribery, extortion, and corruption, wasn't too pleased about being nominated. The Citizens Against Government Waste website says Young was April's Porker of the Month for defending earmarks and pledging to continue his state's disproportionate harvest of federal tax dollars. On Tuesday, January 22,2008, your organization saw fit to add me to your list of "Porker of the Year" nominees. First off, I would like to make a few corrections to the paragraph explaining my candidacy. In Fiscal Year 2008 I brought in funding for 18 projects (not 19) and they totaled a little over $10.3 million (not $17.1 million as you calculate). This is hardly even a blip on the radar of a multi-billion dollar budget, and especially when other Members have earmarked hundreds of millions. Also, you make mention of money for an earmark in Florida that was put into the SAFETEA-LU Highway Bill in 2005. Did I misread your press release when it said it was for projects secured in 2007? I have never hid the importance of earmarks to the State of Alaska. According to the Washington Budget Report, "earmarks are a fraction of one percent of the Federal Budget and impact who makes the decisions on various projects--the Executive Branch or the Congress--not how much is spent." The amount of overall spending is determined by the Congressional Budget Resolution. Every earmark secured was requested, more likely than not, by an Alaskan community or nonprofit organization that needed federal assistance. Coincidentally, on the same day your riveting press release was sent out, I received an email about a project I had secured for $1.6 million. Because of this project, titled Constant Look Operation Support Environment (CLOSE), the 125th Stryker Brigade combat team out of Fort Wainwright, Alaska will deploy to Iraq in September with the ability to see, in real time, people through walls, determine whether they are armed or not and watch them maneuver. They won't have to ever enter a building without knowing if there are enemies inside and what their locations are. And it is only because of this earmark that it will be ready in time for the Stryker's deployment. So Mr. Schatz, essentially what you are saying is that countless Alaskan Lives (and the Lives of our military in general) are not worth $1.6 million? In addition to preventing military casualties, this earmark also saved the government untold millions of dollars as it will be developed at the Battle Lab at Fort Huachuca (where the Anchorage company Immersive Media Corp serves as one of the main contractors). The government now owns this technology and does not have to pay licensing fees. In short, Mr. Schatz, I invite you to travel to Alaska and talk to our military using new technologies that will save their lives; talk to the Alaskans who frequent food kitchens so they can feed their families; or those Alaskans who visit the new Salvation Army Center so they can have a safe, warm place to sleep. All of these things are possible because Alaskans requested assistance and I was able to secure some funding to help them. Visit them after you sit down to a meal with your family, and tuck your children into bed at night, on any given day when you are enjoying being a free citizen because of the United States Military, and tell these agencies and the people they serve what a waste of money their earmarks were. Young didn't mention the infamous Florida land scam in which $41,000 in campaign contributions appeared in Young's bank account days after a $10 million earmark for a Florida project that not one single elected official in the state of Florida had asked for.